« Green Mitered Tank Top Done! When I started knitting lace doilies, one of my friends suggested that I check out the pattern on the cover of Vogue Knitting Summer 2009. It’s an unusual pattern by Shiri Mor. It’s more of a vest than a sweater. It consists of a center circle knit in the round like a doily and a separate border knitted with a variety of lace stitches so that it is larger at the outer edge than the inner edge. Interestingly, the sample is knit in Blue Sky Skinny Dyed Cotton for summer wearing. Given the way that the pattern is knit, it is a strong candidate for a Noro type yarn which would add a wonderful pattern to the center and stripes to the outer circle. When I first thought about doing the top, I wanted to combine several colors. I wanted to use the watery blues and greens that have been showcased in Eileen Fisher’s windows on Fifth Avenue this spring. Due to the fact that I’ve been on a yarn diet (of course, those of you who are regular readers know that I allow myself yarn treats and occasional splurges like MDSW and Webs Tent Sale.) Therefore I decided to use some Tahki Cotton Classic from my stash. 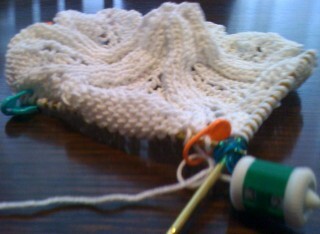 The 4 1/2 balls of white Tahki Cotton Classic (or 432+ yards) that I got at a yarn swap wasn’t enough to make the top. Combined with one or two other colors, it was a good start. After studying the Botanica Medallion pattern, I realized that it was difficult to adapt to multiple colors in the way that a vintage doily might be. Therefore, I bought 5 skeins of aqua at Purl By the Sea (or 540 yards) in Montauk. While it’s a rare event that I get gauge (of course, I was using needles that were 2 sizes smaller), I set out to knit the medallion centerpiece of the sweater. After knitting about 34 rows of the 54 rows needed, I realized that, while my gauge was on target, the piece even after blocking was way too small to work for me. Given that the centerpiece of the Botanica Medallion consists of close stocking knit and reverse stocking knit, I chose not to increase the needle size to make the piece larger. 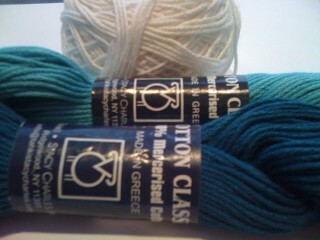 Also, I am using 100% cotton which should be knitted tightly for garments. 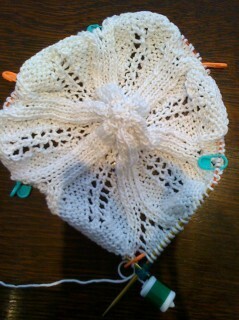 Therefore, I decided to look for another doily to use in lieu of the flower / starfish pattern medallion of Mor’s piece. While some of you dear readers might be upset at this change, I am thrilled since it will allow me to use a variety of colors and to have a unique design at the center. I am thinking about making the border striped but I am not sure that I will like the color changes. I will need to test knit them. P.S. For those NYC based knitters, Shiri Mor is teaching a class focused on making the Botanica Medallion at Knitty City.